In the spring of 2005, Letha Dawson Scanzoni was walking home from an errand and took a shortcut through an alley. She came across a small, discarded, weather-beaten sign poking out of some debris that had apparently washed away from nearby construction work completed months earlier. Encrusted with mud, the wrinkled vinyl sign read, “Caution: Buried Power.” She and Nancy Hardesty had just volunteered to coordinate the next EEWC conference, and as they talked on the telephone later that evening, Letha told Nancy about the little sign and its message. “That’s just like women,” Letha said, “buried power.” They searched their Bibles, looking for references to power, buried power, even buried treasure. They found Ephesians 3:16-21, and the 2006 EEWC biennial conference theme, “Rooted in Love, Powered by God” was born. 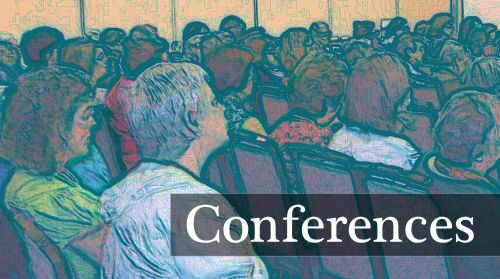 Approximately seventy inclusive biblical feminists gathered at the Hyatt Charlotte Hotel in Charlotte, North Carolina, from July 20 to 23 to enjoy speakers, music, workshops, worship, and togetherness. Longtime EEWC members and new friends were drawn to the conference from advertising in the conference brochure mailed to members and inclusive churches in the region, our EEWC website, Ms. Magazine, Christian Century, Feminist Studies journal, Women’s Review of Books, Sojourners magazine and the e-mail distribution list SojoMail, Western North Carolina Woman magazine, and press releases in local newspapers. Friday was rich with plenary addresses. The first was presented by Reta Halteman Finger, who utilized her expertise as a professor of New Testament at Messiah College to analyze the message of equalizing love in the book of Ephesians in its original context of Roman colonization. In the evening, Virginia Ramey Mollenkott, professor emerita and author, urged Christian feminists to express God’s love in the world by challenging economic and racial injustice. Local political leader and Pentecostal Holiness pastor Mary Emma Evans spoke next, expressing her conviction that “the ground is level for all people at the foot of the cross” through both speech and powerful gospel song. Friday was rounded out with workshops. There were so many wonderful options, from art to writing to psychology to poetry to social justice, that it was difficult to choose just a few to attend. Early risers enjoyed the devotions and movement of morning meditations, led by Indiana chapter member Kay Kiehlbauch Nannet. On Saturday, hymn writer and Brevard College professor Mary Louise “Mel” Bringle presented her plenary, “Breadth and Length and Height and Depth: Hymns of Expansive Love.” The room was filled with weeping as we sang together Mel’s hymns honoring human diversity of age, race, class, nationality, ability, and affectional orientation. The Hyatt Queen’s Courtroom resonated with the sounds of “The Love that Goes Unspoken,” “When Hands Reach Out,” and “When Memory Fades,” accompanied on the piano by Janice Pope. To illustrate the range of theologies among us, and to emphasize that no one person represents the official theology of EEWC, previous speakers Reta Halteman Finger and Virginia Ramey Mollenkott were joined by All We’re Meant to Be coauthor Nancy A. Hardesty, and professor of communication Alena Amato Ruggerio for a theological panel discussion. S. Sue Horner moderated the conversation on the three questions of the nature of God and the divinity of Jesus, interpretation of the Bible, and sin and salvation. Audience members provided their own perspectives and asked further questions. This open exchange continued into the following workshop time and will be extended into the pages of an upcoming issue of Christian Feminism Today. The business meeting held good news for the financial future of the organization, thanks to generous donations and faithful pledging. We also honored Judy Jahnke as she ended her service as the Central Office Manager, and celebrated Sharon Bowes for stepping into that role. We heard reports of our successful outreaches through the magazine Christian Feminism Today and our website, and about the preservation of our history in the archives at Union Theological Seminary. The final bidding ended Saturday at the silent auction, which was a great success thanks to those who donated five tables full of beautiful items, and also to those who bid with such open hearts. Lucky winners brought home with them a handpainted liturgical stole, an embroidered piano bench cover, the EEWC statement of faith in cross stitch, earrings and pendants, inscribed books, handknitted clothing, a stay at an inn, baskets of food, floral-painted tools for the handy feminist, and more. Saturday evening closed with a dramatic presentation on ancient Jewish, Christian, and Muslim women by author and musician Martha Ann Kirk, assisted by music therapist Catherine Cuasay. Sunday afternoon, some departed to return to their homes across the country. Others stayed for the Council meeting to do the administrative work of the organization. We thanked Chicago representative Arlynne Ostlund for her leadership as EEWC Coordinator for 2006, and looked forward to Hoosier Georgean Johnson-Coffey’s guidance as Coordinator in 2007. 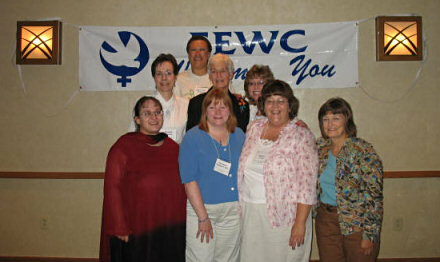 We also heard that a few people are already contemplating a call to plan the 2008 EEWC conference, but will be taking some time to explore, research, and pray before the October 2006 deadline to commit. Letha Dawson Scanzoni still has the little red flag that says, “Caution: Buried Power.” Perhaps she will pass it along to inspire the ’08 committee, whoever they might be, to continue to unearth and celebrate the buried power of women. Ed. Note: This conference report was written by Alena Amato Ruggerio (bottom row, left), Assistant Professor of Communication at Southern Oregon University. Before her move to Oregon, Alena was active in the Indiana EEWC chapter and joined the group for this photo during this year’s conference in Charlotte. Bottom row (l-r): Alena Ruggerio, Georgean Johnson-Coffey, Barbara Crews, Becky Bender. Second row: Elizabeth Bowman, Sharon Bowes, Kay Nannet. Top row: Helen Claire Ferguson. That doesn’t happen in Los Angeles. You know you’re in the Bible Belt when the highway circling the city is named Billy Graham Parkway. You realize it again when the Hyatt Hotel staff bends over backward to meet all your conference needs and bills you for less than your contract requires on many items. This unique location hit me again after the conference when I was taking a cab back to the airport and my driver announced that he had been a missionary to Indonesia, Russia, Zimbabwe, and South Africa with The Evangelical Alliance Mission (TEAM) based in Wheaton, Illinois. I had jumped into the taxi at 3:25 pm for a 5:11 pm flight, just having visited Letha Dawson Scanzoni, recovering from acute gastritis in Presbyterian Hospital, as well as exhaustion from having co-planned the wonderful conference. Tired and nervous about catching my plane, I didn’t want to talk, but the driver was definitely feeling talkative. “Where are you from? Why are you here?” he asked, an older gentleman, African-looking, with an accent that sounded Caribbean. “L.A.— I’m here for a conference of Christian women,” I admitted, definitely not using any of the big words: feminist, evangelical, inclusive. There are times when biblical feminism is the last thing you want to talk about, and the end of a five-day immersion in an EEWC conference and business meeting is one of them. My cover was blown. I knew I was in for an intensive twenty minutes. “You’re very well read,” I commented reluctantly. “Yes, I’ve been a missionary in four cultures around the world for twenty-five years, so I had to do a lot of reading to relate to different people,” he explained. “Oh, so your traveling has educated you,” I said. “What is your group’s mission? Do you have a mission statement?” he continued eagerly. I began fumbling for the EEWC brochure and a newsletter. By now we were launched into a full-fledged theological discussion that lasted all the way to the airport. He described situations in churches that he had founded and said he was planning a trip to revisit some of those churches. “You’re a regular Paul the Apostle,” I said as we arrived at the terminal. “I’ll read it,” he promised, and I believed him. I could see Letha’s and Nancy’s gospel flying to the uttermost parts of the earth in his hands. Entering the terminal, I checked in for my flight, still dazzled by the continuing presence of the Holy Spirit but praying that the person next to me on the flight might be interested only in sleep. Anne Eggebroten is a writer on women’s issues and a research scholar with the Center for the Study of Women at UCLA. She is a Southwest representative on the EEWC Council. Martha Ann Kirk is professor of religious studies at the University of the Incarnate Word, San Antonio, TX and a member of the Sisters of Charity. A recipient of an “Art of Peace” award for her use of the arts in peacemaking, she directs a program of ecumenical presentations on justice and peace, using story, drama, dance, and music. She is internationally recognized for her work in building bridges between Jews, Christians, and Muslims. Her most recent book is Women of Bible Lands: A Pilgrimage to Compassion and Wisdom (Liturgical Press, 2004). Catherine Cuasay is a music therapist who integrates her gifts of singing, playing, dancing, drawing, acting and prayer leadership to transcend cultural and language barriers in healing work. Originally from the Philippines, she and Martha Ann Kirk have been collaborating in creative prayer with music, mime, drama, and dance since 1991. Janice Pope earned her master’s degree in piano performance at the University of North Carolina at Greensboro and her master of library science degree from the University of North Carolina at Chapel Hill. In addition to using her musical gifts at every opportunity, she works as a reference librarian at Central Carolina Community College. Reta Halteman Finger is assistant professor of New Testament at Messiah College in Grantham, PA and is the former editor of Daughters of Sarah magazine. Reta is uniquely skilled in relating the Bible to today’s issues. She is the author of Paul and the Roman House Churches: A Simulation, and co-editor with Kari Sandhaas of Wisdom of Daughers: Two Decades of the Voice of Christian Feminism. Virginia Ramey Mollenkott, a frequent speaker for EEWC conferences, is the author or coauthor of 13 books, including Women, Men, and the Bible; Sensuous Spirituality; The Divine Feminine; Omnigender; and (with Letha Dawson Scanzoni) Is the Homosexual My Neighbor? A Positive Christian Response. Dr. Mollenkott’s web site is http://virginiamollenkott.com. Mary Emma Evans is a Pentecostal-Holiness pastor and an elected member of the Henderson (NC) City Council. She formerly served as a minister in the United Church of Christ and contributed to the book, God Speaks, Women Respond: UCC Women in Ministry Tell Their Stories. Mary Emma is an activist for civil rights and economic justice and has a special ministry to homeless people. She is also a gospel singer whose voice has been compared to that of Ethel Waters and Mahalia Jackson. Her CD of gospel music, Happy with Jesus Alone, is available from Minnow Media. Mary Louise “Mel” Bringle is professor of philosophy and religion and chair of the Humanites Division at Brevard (NC) College and author of several books. She is also a hynmwriter and has won numerous international hymnwriting competitions. In 2002, the Hymn Society of the U.S. and Canada honored her by voting her “Emerging Hymn Text Writer.” Her first single-author collection of hymn texts, Joy and Wonder, Love and Longing, was published by GIA, and a second hymn collection will be published in the summer of 2006. She wrote “Songs as Yet Unsung: Why the Church Needs New Hymns” for the Spring 2003 issue of EEWC Update. Alena Amato Ruggerio is assistant professor of communication at Southern Oregon University in Ashland, OR. 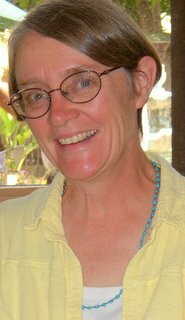 She is a prolific writer whose articles have been published in EEWC Update, Christian Century, The Other Side, Sightings, and Oregon Humanities. Nancy A. Hardesty is professor of religion at South Carolina’s Clemson University. Her books include Women Called to Witness, Inclusive Language in the Church, Faith Cure:Divine Healing in the Holiness and Pentecostal Movements, and All we’re Meant to Be (with Letha Dawson Scanzoni). Nancy Hastings Sehested describes herself as “a Baptist preacher and storyteller.” She is a chaplain at a state maximum-security prison for 900 men. She also serves as co-pastor of the ecumenical Circle of Mercy Congregation in Asheville, NC. Open Art Studio. Led by Kathryn Pigg, artist, poet, and retired Methodist minister, this workshop will be ongoing throughout the conference, offering attendees opportunities to express the conference theme in various media. Mary Jo Cartledgehayes, a Methodist minister and author of Grace: A Memoir, tells How to Get Published Now. Ken Sehested, long-time peace activist and co-pastor of Circle of Mercy Congregation in Asheville, NC, joins his wife Nancy Sehested in a workshop on Doing Justice and Loving Mercy. Psychiatrist Elizabeth S. Bowman, who also holds a Master of Sacred Theology degree, presents The Good, the Bad, and the Downright Ugly: Distinguishing Healthy from Unhealthy Religious Systems. Literature editor and retreat leader Linda Williams guides us in Transformations: Reading the Poetry of Jane Kenyon, Naomi Shihab Nye, and Mary Oliver. Hospice chaplain Jan Clark will present a workshop on end-of-life issues. Peace Corps volunteer Anna Warren, back from her work in Mali, on women in the developing world. Marriage and Family Therapist Sharon Billings on Growing through the Fear Factor Exploring Spiritual Journeys We Didn’t Expect to Take. "It was supposed to be just a gathering, a reunion of friends who have worked for biblical feminism for twenty or thirty years—and in the case of some, even forty years. But the 2012 event in Indianapolis turned out to be a power-packed conference with speakers and workshops to rival any of our past landmarks in Pasadena, Seattle, Norfolk, Saratoga Springs, San Francisco, and Chicago."